On Sunday afternoon, Mark Hamill took the stage for his solo panel at Star Wars Celebration. From the moment the event began, the crowd was treated to Dad Skywalker at his finest. The event quickly took on an intimate mood, which was remarkable for a room where thousands of people had come to hear the beloved actor speak. Dad Skywalker casually engaged the gathered fans for a conversation rather than a show. “A show involves, first of all, preparation,” Hamill joked. “People will ask you about it and say, ‘What was it like?’ ‘I don’t know, but it wasn’t a show.’” And he was right, it wasn’t a show. But it definitely didn’t disappoint. Fans laughed along as Hamill did impressions, told stories, and reminisced about a lifetime spent as Luke Skywalker. Hamill’s disarming manner set the tone for the panel as he told the story of the day he realized that the English background artists — extras, as they’re called in the United States — deserved to be brought in on the magic of Star Wars. 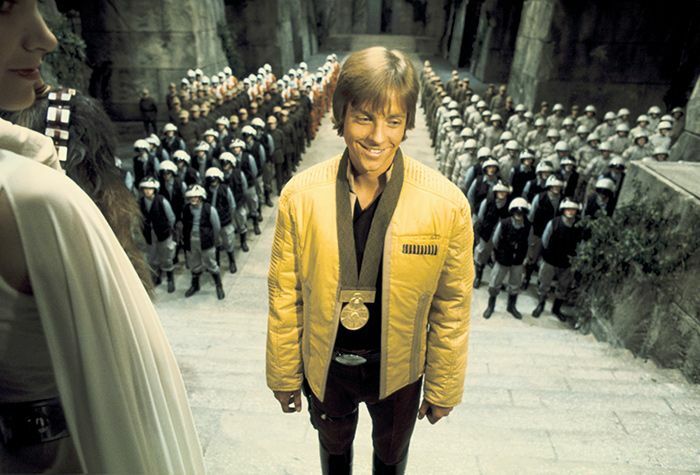 While filming the final medal ceremony scene from A New Hope, the extras were grumbling and lobbing insults at the stars. Hamill explained that the extras had no idea what the scene was about, and felt resentful about being kept in the dark. As Dad Skywalker drifted easily from topic to topic, he took a moment to dispel a Star Wars myth that says he burst a blood vessel holding his breath underwater during the garbage masher scene in A New Hope. He explained what really happened. “You know how you can make your face really red by forcing blood to your face?” he asked the audience. “I thought it would be so cool — once I went underwater, you know they wrapped the Dianoga tentacle around my neck — if I came up and I was just scarlet red like I was being choked.” He burst a blood vessel in his eye, so for the next few days, they couldn’t show that side of his face onscreen. “‘Why did you do that? It was really stupid,’” Hamill said, in his best George Lucas impersonation. Lucas then told him about red camera filters that made his whole effort moot. The impressions didn’t stop there. Hamill recounted the time Harrison Ford taught him that it’s better to not ask for Lucas’s permission when changing lines of dialogue. “‘Look. Don’t ask, just do it,’” Hamill recounted Ford telling him. And he’s carried this lesson forward, ad-libbing with great results in Flash. And speaking of his voiceover work, Hamill couldn’t quite achieve his Joker voice, due to a sore throat. But he did his best for the fans, mustering a couple high-pitched chuckles. Hamill also established his fanboy bona fides by telling the audience how, in 1972, he freaked out over meeting actor Kerwin Matthews and interviewing him about working on The 7th Voyage of Sinbad with Ray Harryhausen, a pioneer of movie monster-making. “I want you to think of me as a friend, and not an internationally-beloved, BAFTA-winning actor and pop-culture icon,” he told the audience, laughing at his own joke in a very dad-like way. Dad Skywalker also told the audience about some of his upcoming work, including a second season of Mark Hamill’s Pop Culture Quest and a new Twilight Zone-style show called Dimension 404, which he’ll be narrating, among a couple other projects, including a MST3K cameo. He also read some of his Han Solo lines from the Force Awakens edition of “Bad Lip Reading”. “I’m not sure how fond Harrison is of my impression,” he admitted. So even though fans will have to wait until December to see Mark Hamill return as Luke Skywalker in The Last Jedi, there will be plenty of Dad Skywalker to tide us over between now and then.